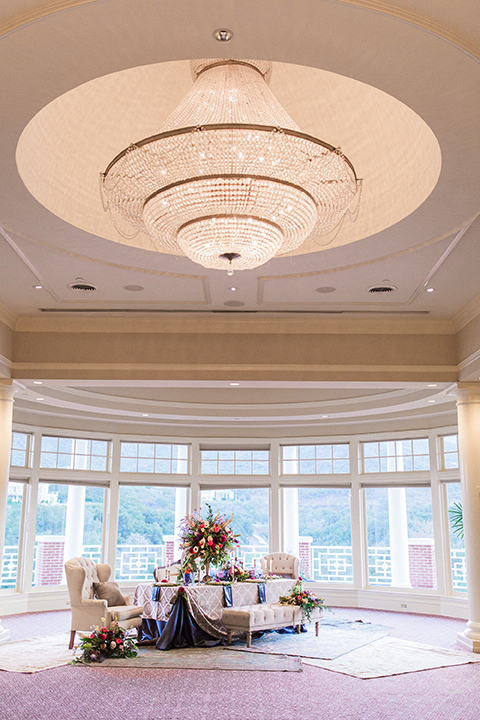 When picturing a country club wedding, most probably imagine a classic white celebration with towering ivory centerpieces and crystal details. 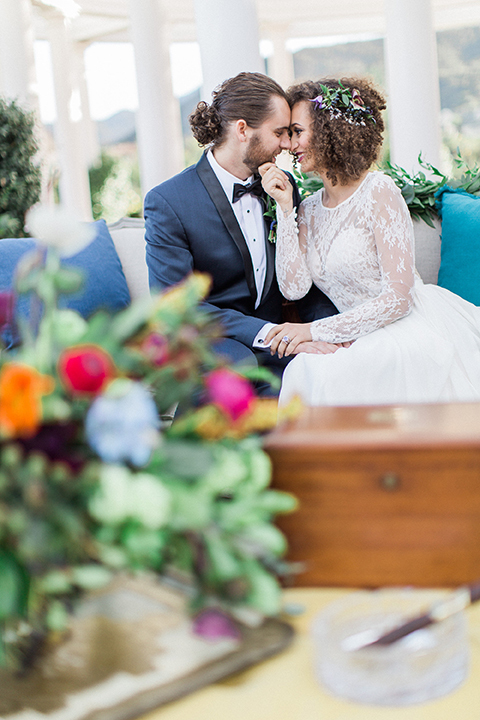 However, as this inspirational shoot reveals, a venue choice does not have to dictate your style. 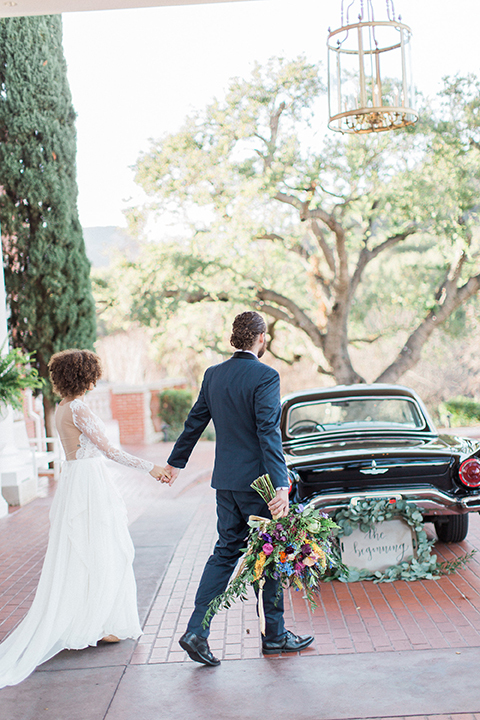 The creative team behind the shoot was inspired by the Southern California country club, but took it in a direction off the beaten path. 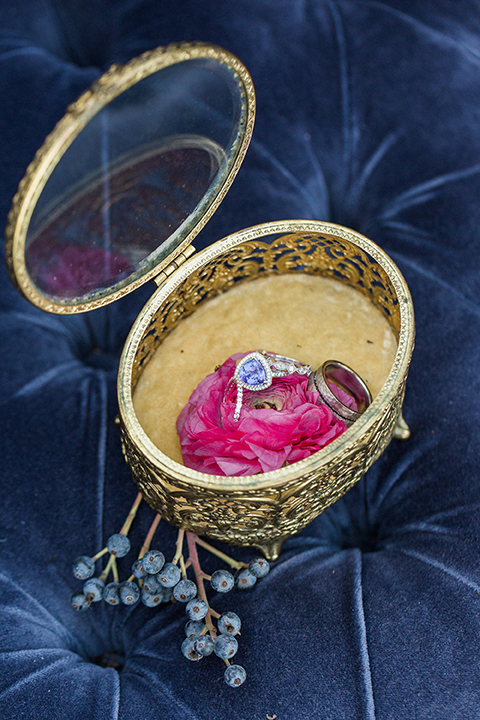 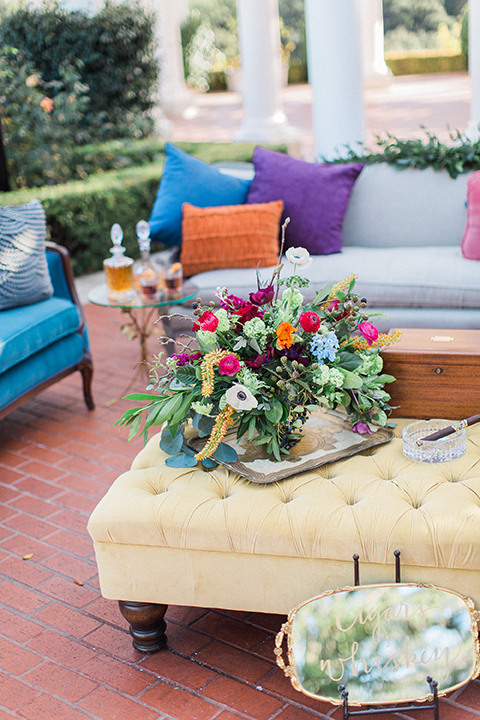 “Each vendor brought their love and free-spirited creativity to help create our classy bohemian vibe,” shares the team. 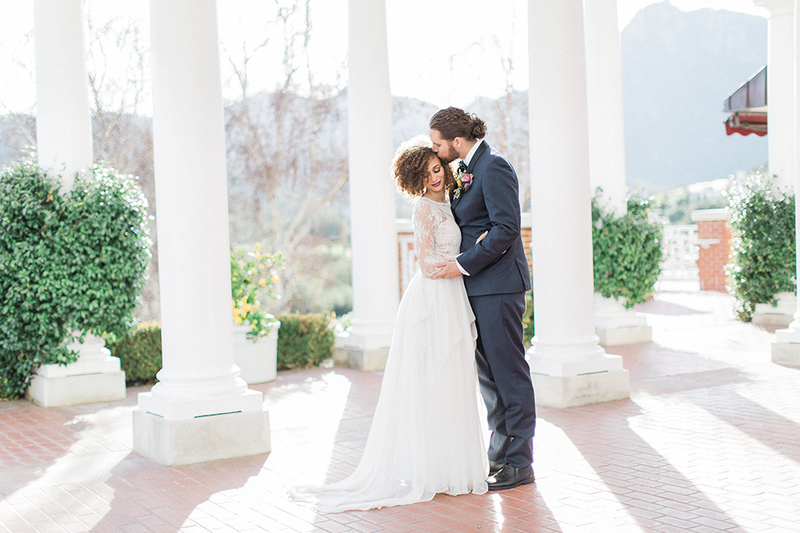 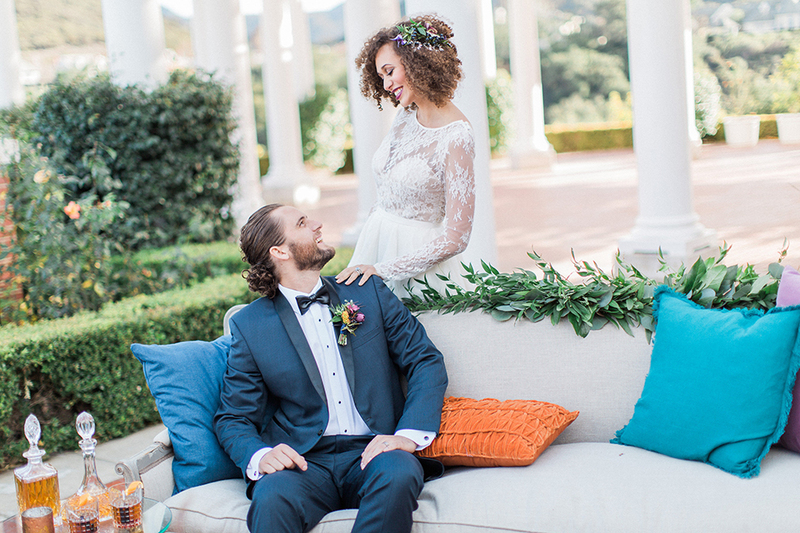 Styled after a Georgian estate, the club features beautiful gardens, fountains, lakes, and a stunning backdrop of the Santa Monica Mountains. 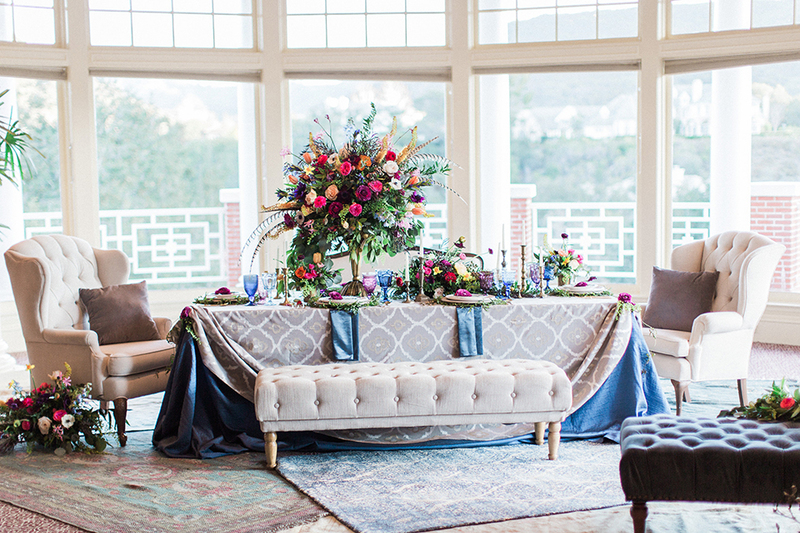 “When you walk onto the property, you automatically feel the luxury and grandiose and elegance that is ideal for weddings,” adds the creative team. 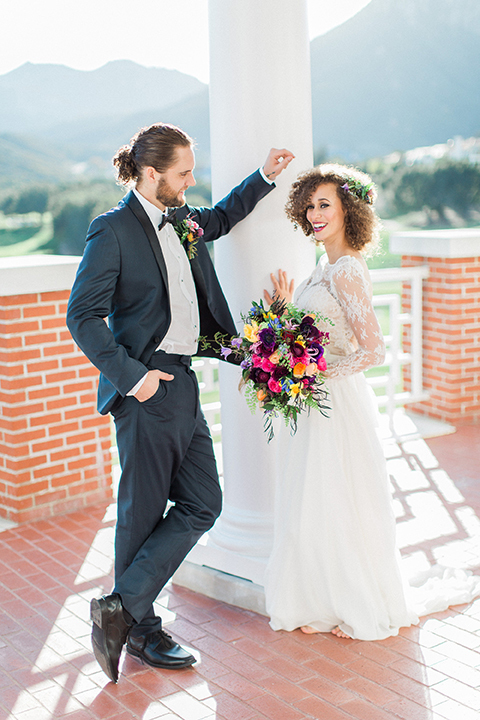 The chic, hip models acting as bride and groom also happened to be in a relationship, making for natural chemistry in the photos. 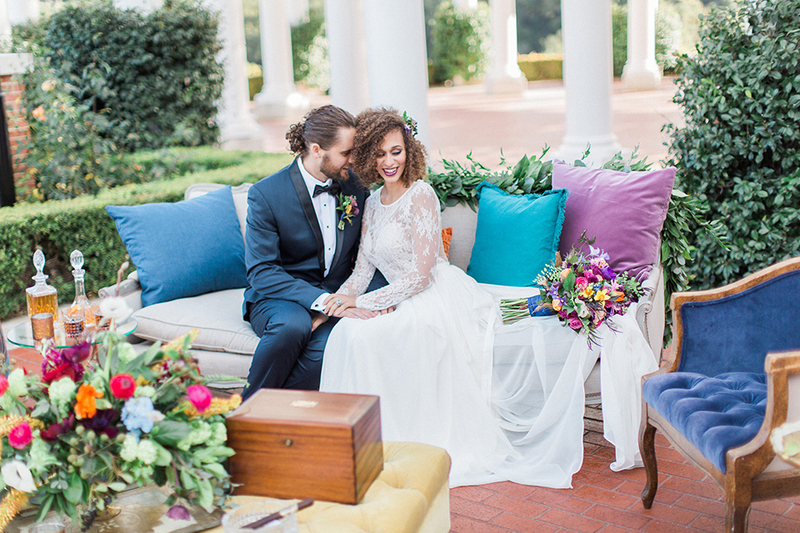 The bride’s gown “was romantic with a touch of sophistication, which we really felt complemented the shoot,” divulges the creative team. 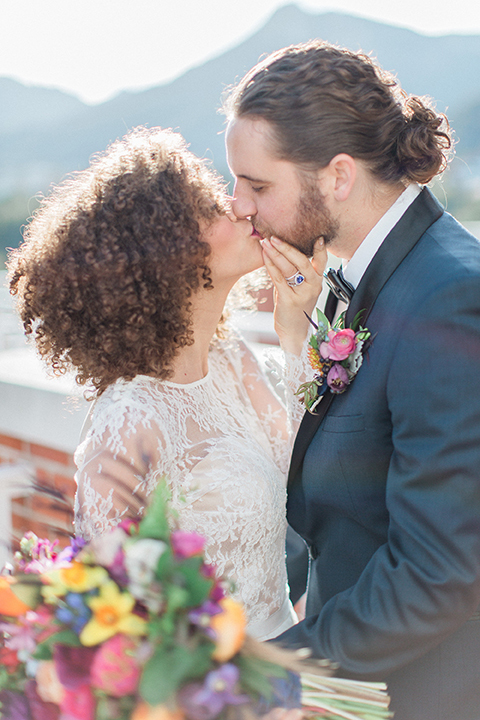 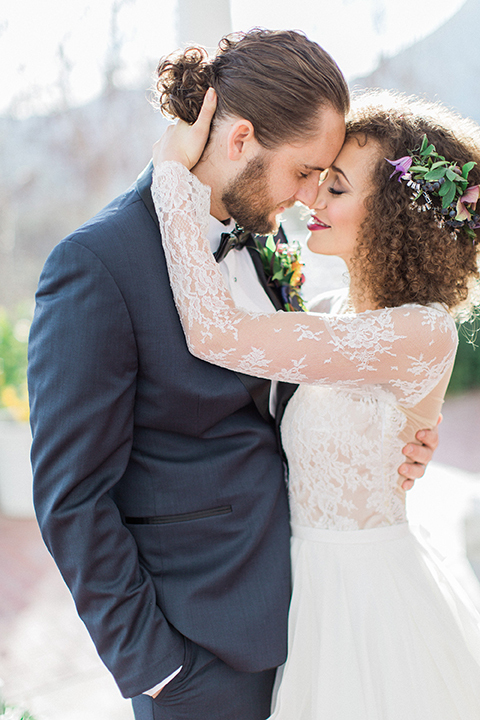 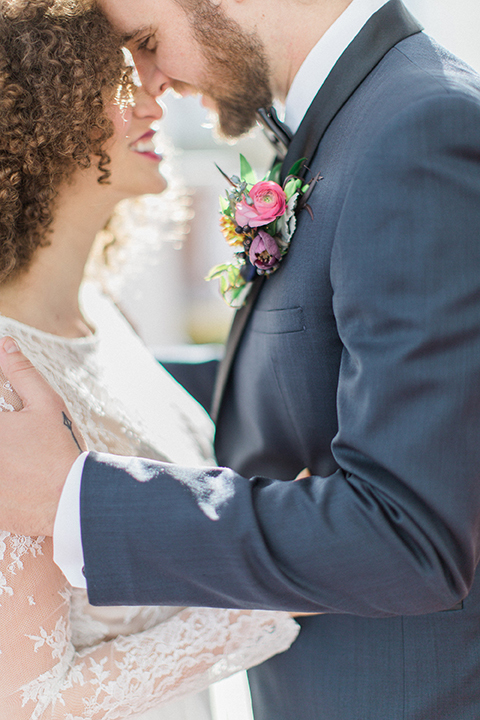 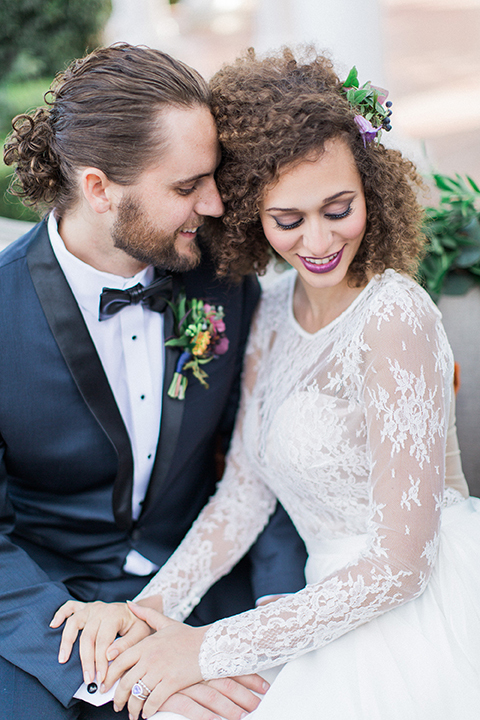 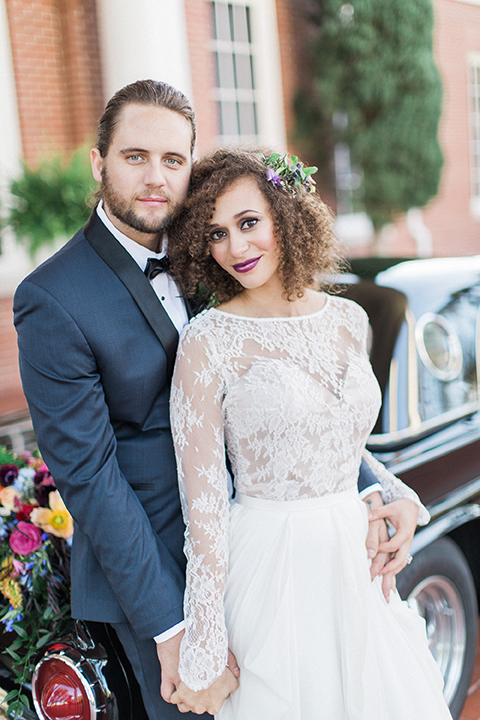 “The bodice was made of a delicate French lace and had a draped silk chiffon skirt that really moved when the couple danced.” Her free curls were pinned back on one side with a vintage-inspired jewel woven with hellebore flowers. 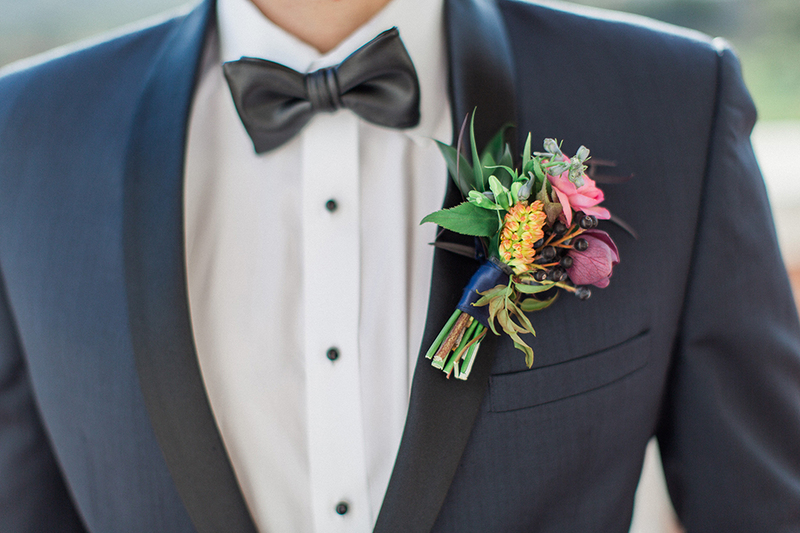 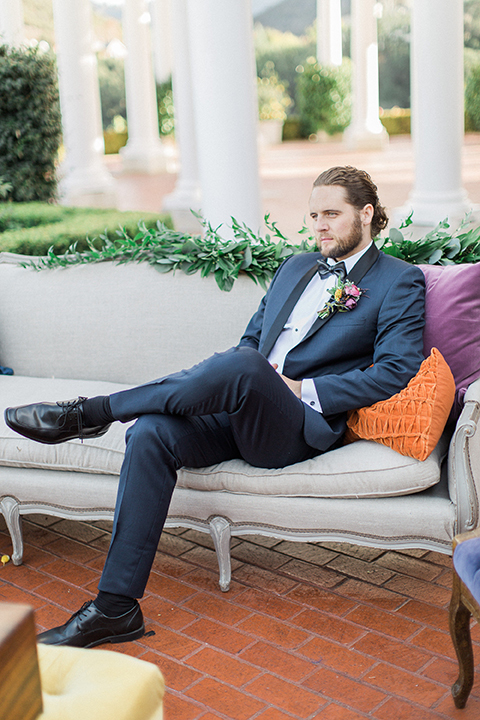 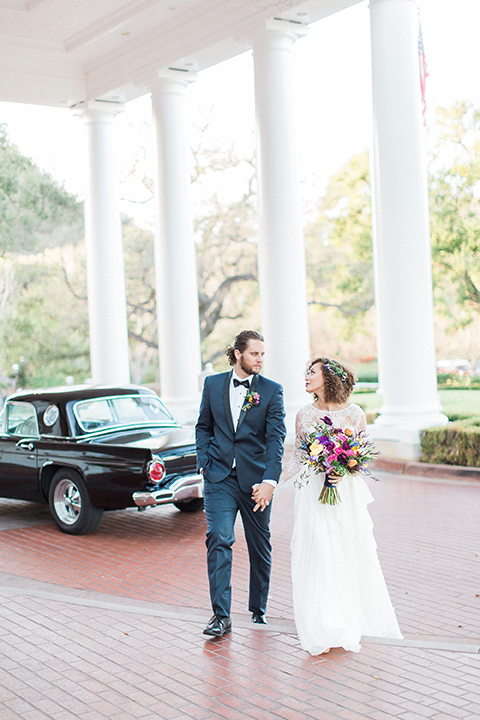 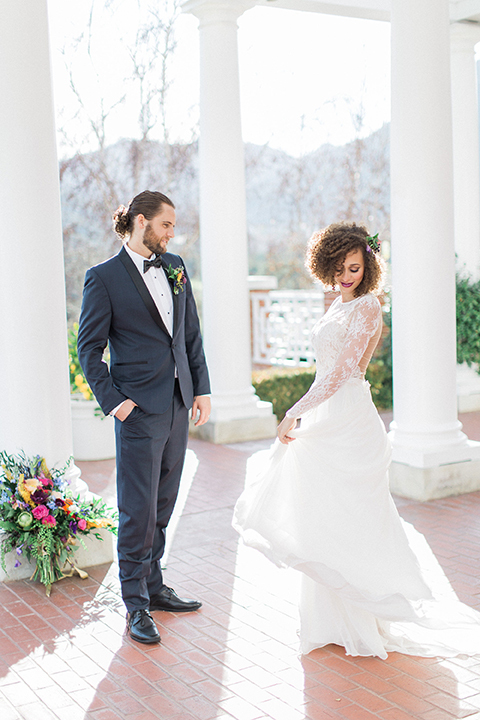 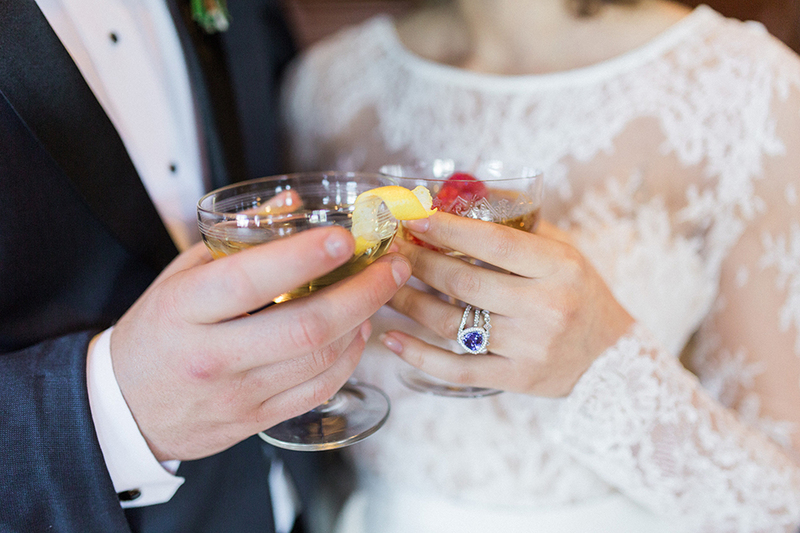 The groom donned a navy suit with ebony lapels, artfully paired with a black leather bow tie. 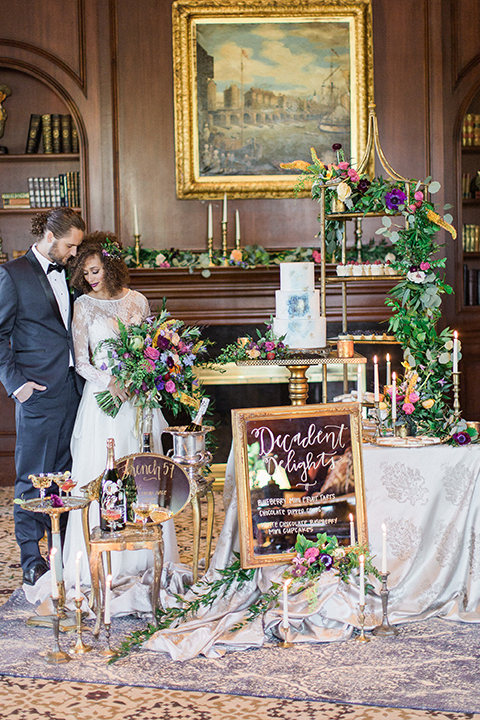 To add to the décor, the creative team set up elegant dessert and drink stations in a room featuring warm wooden walls. 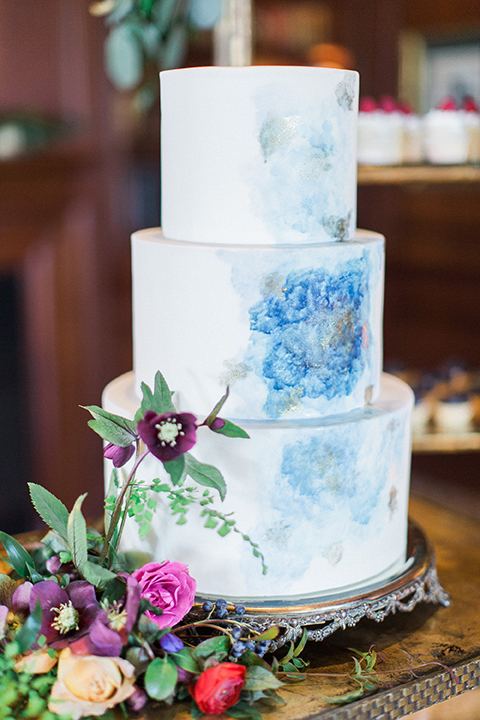 The three-tiered cake was handpainted in a watercolor style that managed to be reminiscent of both flowers and the ocean. 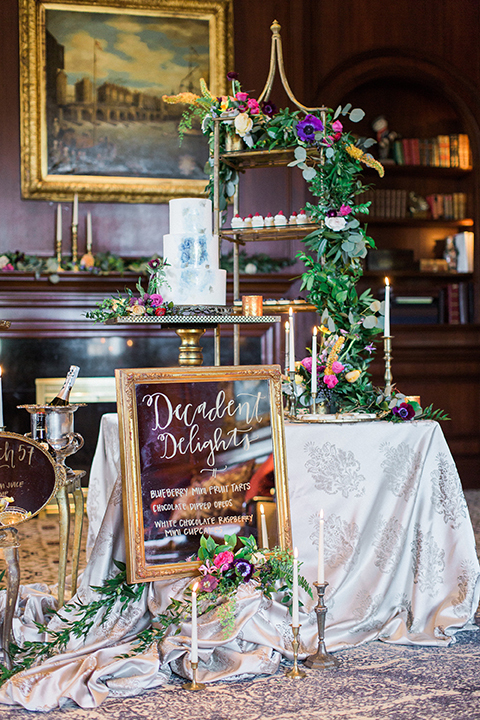 A gilt-framed mirror listed the confections in calligraphy, while a golden tray displayed the drink menu. 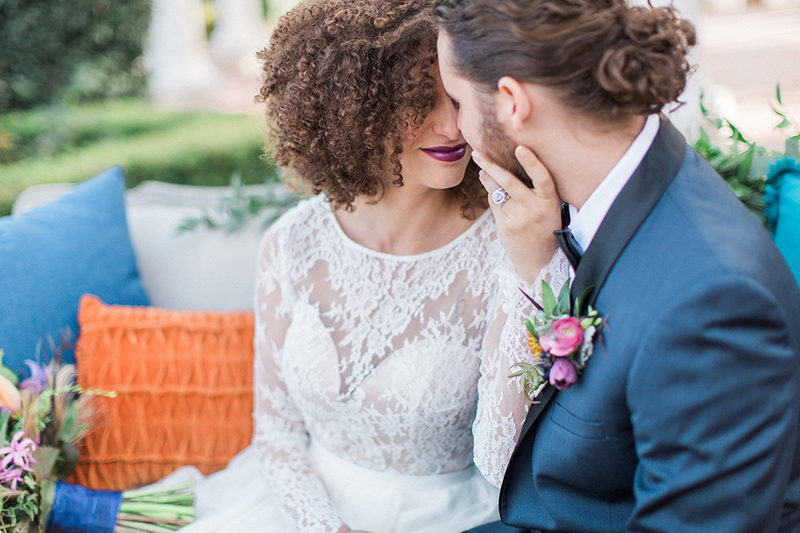 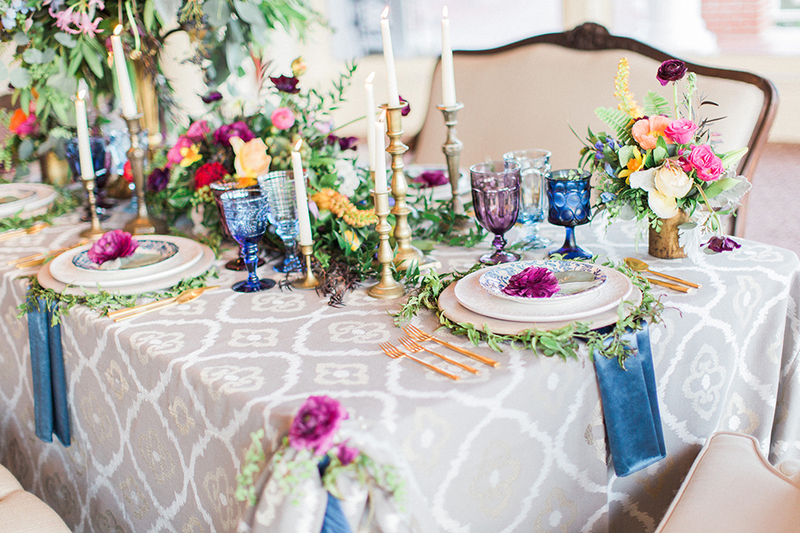 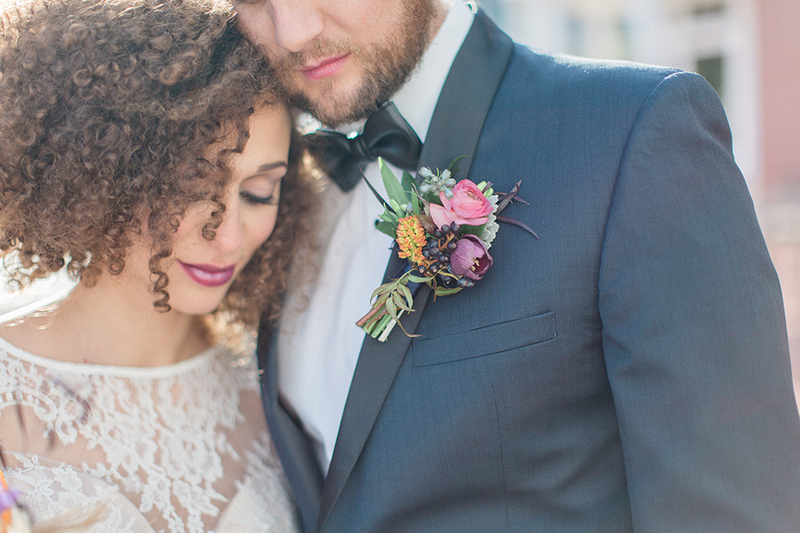 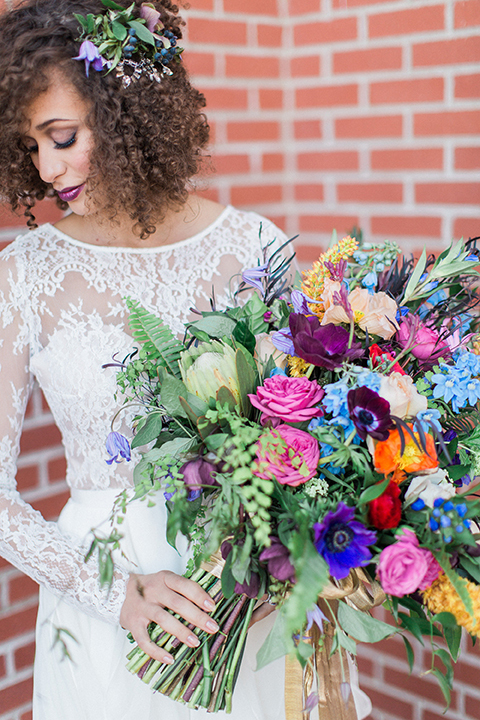 Vibrant florals were the real standout in the styled shoot. 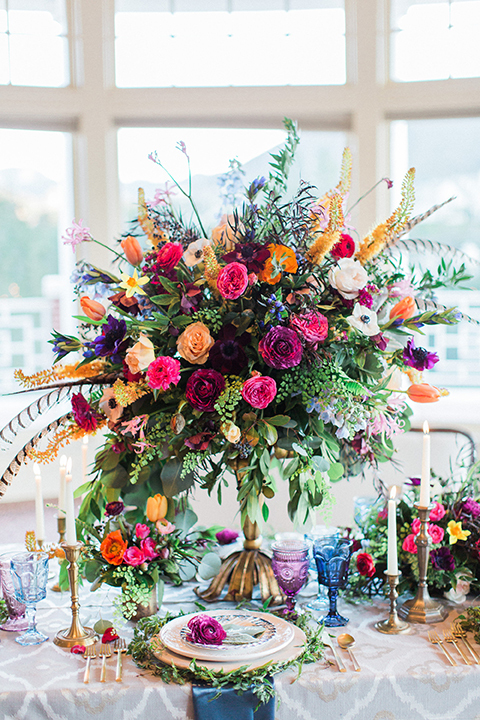 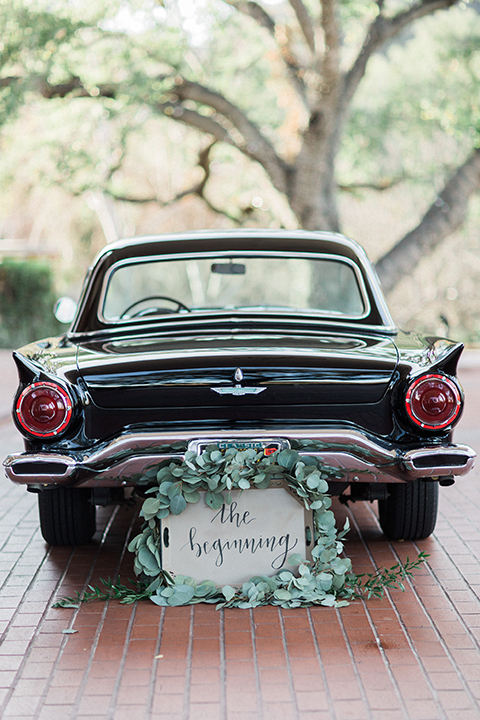 Blossoms in every color of the rainbow were enveloped by lush greenery to keep the look from being over the top. 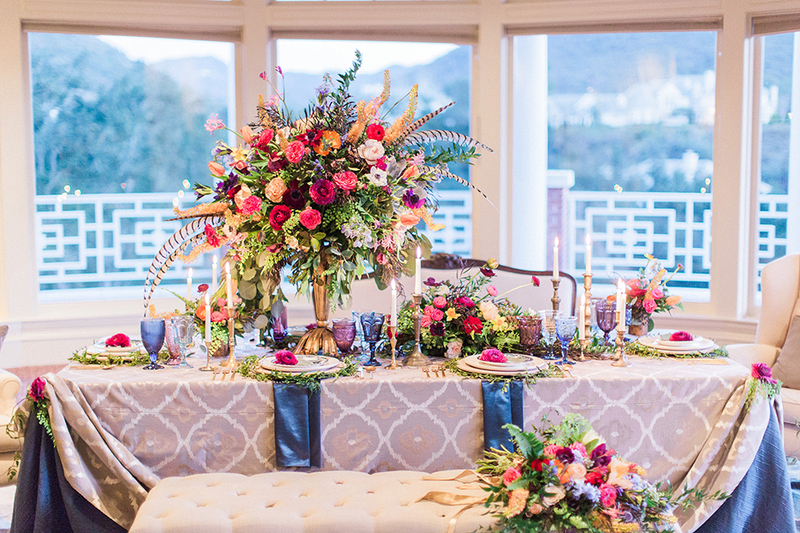 The centerpieces included garden roses in magenta, fuchsia, blush, and peach, as well as pops of orange tulips and purple anemones and hellebore. 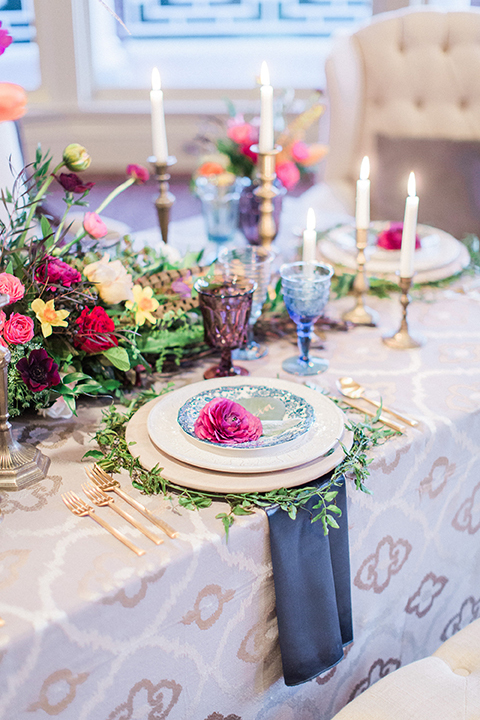 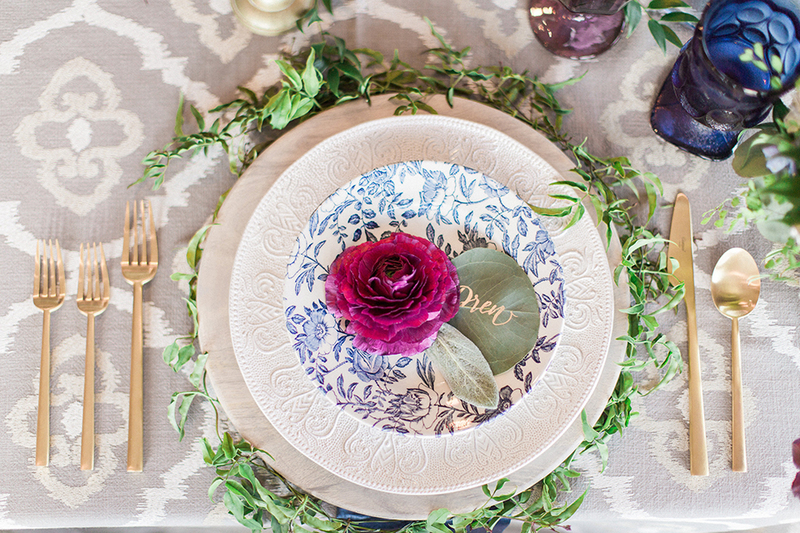 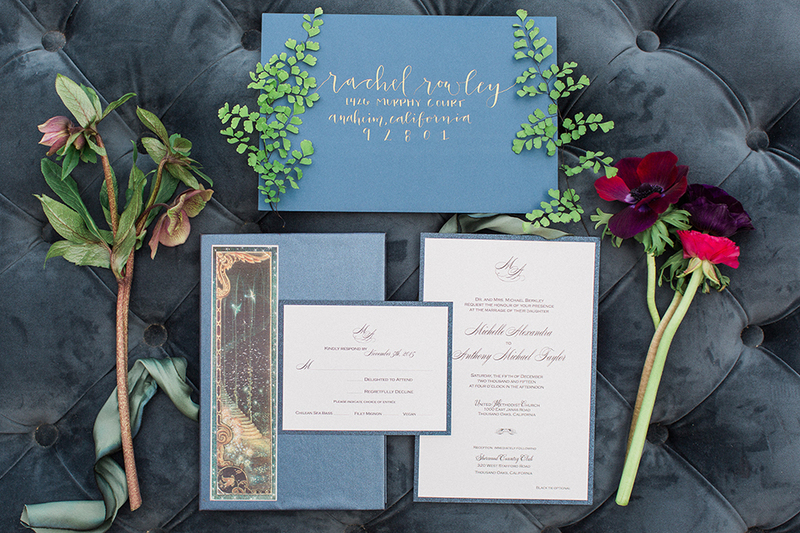 “Each place setting had perfect plum ranunculus with eucalyptus leaf name cards,” says the shoot’s creative team. 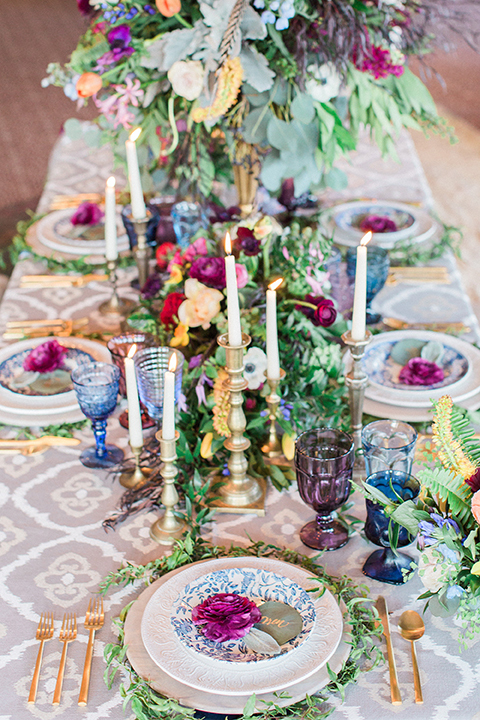 Candlesticks in silver and gold were peppered amongst the verdant décor. 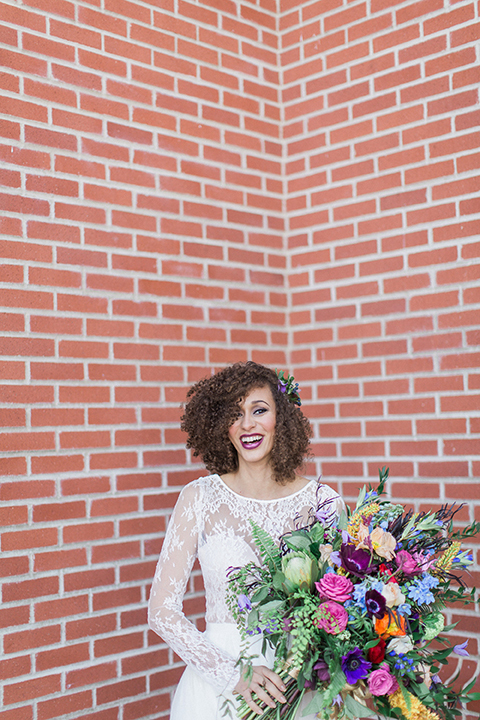 “The bride’s beautiful arm bouquet included the same lush garden flowers, plus clematis and maidenhair fern and pops of blue to complement the shoes,” they reveal. 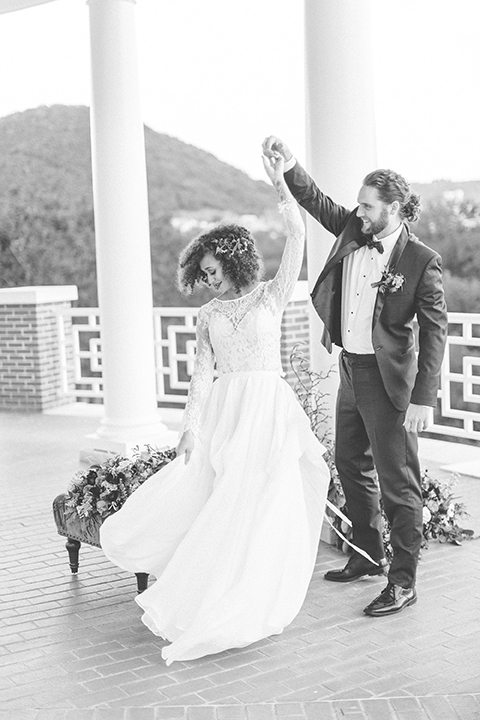 The shoot brought together friends in the industry, and the cohesion is clear in the photos that are sure to inspire real brides.